The United States Conference of Catholic Bishops established National Bible Week from November 15–21, 2015 in celebration of the 50th Anniversary of the Second Vatican Council Dogmatic Constitution on Divine Revelation, Dei Verbum. This is a great time to load a Bible app onto your mobile device. The Word of God is ALWAYS with you when you have a Bible app on your mobile device. What is the Bible? Bible Gateway (Free) iOS, Android and Kindle Fire. The Bible Gateway Bible App is the official mobile Bible reading and study experience from Bible Gateway (a division of Harper Collins Christian Publishing), offering the many reading amenities (listed below) that you look for in a Bible app. While it offers more than 90 different Bible translations, only one is Catholic– Douay-Rheims (1899) which you can download onto your device (after you give publisher access to your email address) for off-line reading. You will need to go into settings to set it as your default Bible. Bible App (Free) iOS, Android, BlackBerry, Windows Phone, Windows 8, Kindle Fire, Symbian, Java, HP/Palm. Developers say this is the #1 Bible app in the world. You get to choose from hundreds of Bibles in more than 150 languages with interface in 30 languages. Some of the Bibles are approved Catholic versions like NAB-RE and Douay Rheims. A drawback is you must be connected to the internet to use most content in this app, but some Bibles are imbedded in the app so you can read them off line. That leads to another drawback; none of the imbedded bibles in English are Catholic editions. Audio Bibles are available but not downloadable. These include Douay Rheims. Study tools include reading plans, search capability, note taking, highlighting and bookmarking capability. Text can be sized for easier reading. 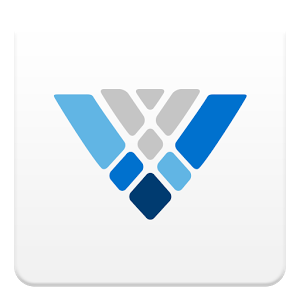 Your bookmarks, highlights and notes are saved on YouVersion.com which you must log into to use. But this gives you cross-platform use wherever you go with whatever relevant device you use to access the Bible you are in the midst of reading. Revised Standard Version -Catholic Edition– ($4.99) iOS only. This Bible version is also known as the “Ignatius Bible.”From developers: This is “an authorized revision of the American Standard Version, published in 1901, which was a revision of the King James Version, published in 1611.” It includes the deuterocanon (seven full books with additions to two others–unique to Catholic Bibles), and explanatory notes. Features: highlight and e-mail text; search word(s); change font size; low-light mode; bookmark; opens to last page read; reading plan. This version is ideal if you prefer a very classic translation void of modern contrivances like inclusive gender sensitivity. Catholic Bible by Just 1 Word ($1.99) iOS only. This app comes pre-loaded with the New American Bible Revised Edition – NABRE. This is the Bible (in English) which is approved for use in the United States and is the one used for the English Roman Catholic Mass readings. Also available in Spanish, Dios Habla Hoy, as an additional purchase $6.99. Laudate (Free) iOS and Android. NAB-RE Bible when connected to internet only. It also offers Douay-Rheims Bible which is local so you don’t need to be connected to the internet. This makes for a large file, so they recommend moving the app to your phone’s SD card if you’re not using an iOS device. 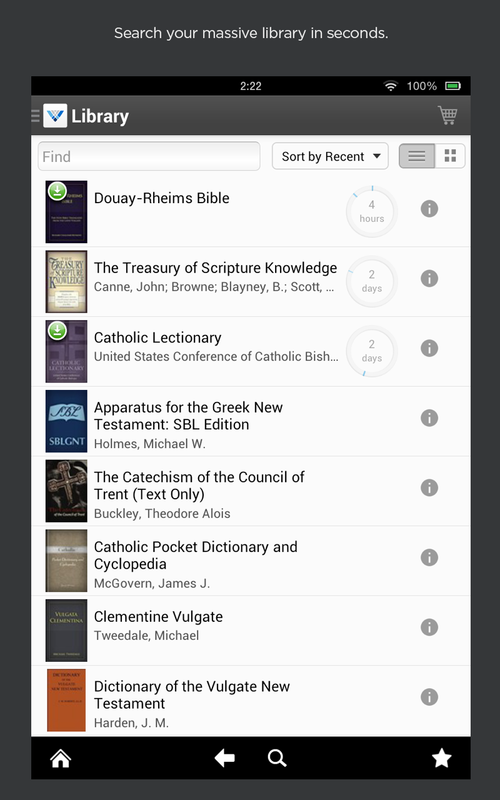 Laudete is a highly popular Catholic app which is loaded with many Catholic resources like a Roman Missal, dozens of prayers, Roman Breviary, rosary, Church documents, and much more in this valuable all-in-one app. iPieta. ($2.99) Full version in iOS and Android is split up into several lite apps. Contains the Douay-Rheims, Clementine Vulgate (Catholic and public domain) Developer note: Psalms are COMPLETE but numbered as in the Vulgate. iPieta bundles many other Catholic resources like hundreds of prayers (some in audio format), Church documents, classic Catholic books, liturgical calendar and much more in this valuable all-in-one app. Words With Jesus (.99 cents) iOS and Android Here’s a neat concept: a Scripture app that only serves up the words of Jesus Christ. That’s right. If you just want to encounter a quote from Our Lord to meditate upon, this is your app. Not only do you get a daily short Scripture passage with the words of Jesus (that can be set with a daily reminder on your device), but you get a nice little reflection to go with it. You may easily share the passage on Facebook and Twitter through this app. Topics can be filtered by category. A link from the passage takes you to an on-line Bible to read it in its entirety in context. This is a terrific way to weave Scripture into your daily life and delve deeper into the Bible with targeted meditations from the mouth of Our Savior. Biblia Católica (Free) Android Misma traducción a la utilizada en la página web del Vaticano! The Truth & Life Dramatized audio Bible New Testament ($19.99 or separate books $1.99 ea; Download Free version includes the Gospel of Mark on audio and a complete Bible text, RSV-CE translation). iOS, Adroid, Windows PC, Kindle Fire, Nook This is the best audio version of the New Testament in the market in this format. Imagine a celebrity-filled “radio drama” of the entire RSV-CE New Testament complete with movie-quality sound effects and an original music score! Catholic Audio Bible in MP3 format (Trial version is free.) iOS and Android. Requires internet connection. Douay-Reims translation of Latin Vulgate in which you can listen to the entire Catholic Bible, both Old and New Testament. The trial version is the lite version which you can download for free and sample a few Scripture chapters. Upgrade to the Pro version to have unlimited access to the complete Old and New Testament. These MP3’s are streamed, not downloaded, so they take up no storage space on your device. Keep in mind, this is not a high-tech modern recording. Developers note this is a vintage recording digitally transferred from tape recordings. You may enjoy that particular audio ambience coupled with the male reader’s British accent. Study Bibles come with tremendous extra resources to help you dig deeper into the text for your study or devotional purposes. Want to discover treasures hidden within Sacred Scripture? A Catholic study Bible is a great place to start. These resources typically include commentaries, extended footnotes, maps, lexicons, photos, Church documents, search capability, Hebrew and Greek translations, concordances and much more. Olive Tree Bible Study (Free to $24.95) iOS Android, Kindle Fire, Windows Tablet, Apple Watch, Mac and PC. A reviewer characterized this app as the “gold standard of Bible study apps.” Check out these videos to see how the various functions work. You will be amazed! The interface to delve into all the various tools is elegant and smooth. All the popular Catholic editions are included in their offering. So much is packed into this gem of an app: extensive footnotes; option to include maps and charts; search capability; load optional commentary; verse chooser; text highlight; book ribbons; pop-up lexicon; ability to make notes in the text. It has a split-screen capability to view two passages simultaneously, so you can keep Greek or Hebrew open while you read English, for example. Free Bibles available in dozens of editions including Catholic. But it does not include or incorporate documents and writings from the Church’s sacred tradition, so that part of your experience of studying Sacred Scripture is not available in this app. If you want that included, choose the free Verbum app instead and skip this one. If you choose an Olive Tree Bible, the FIRST thing you do is download their Bible Reader software (Free). The Bible Reader is the program used to read the text–much like Kindle software is used to read digital books. Once the software is loaded, set up an account and then choose Bibles you want to download from the developer’s web site (includes all the popular versions, study versions, non-English, Greek and Hebrew Bibles!) Prices range from free to $24.95 and the site explains how to retrieve your book for your Bible reader. Bibles and books can be purchased directly from within the app on your mobile device, or they can be purchased through the Olive Tree web site and downloaded to your device later. There are hundreds of free books and study tools in Olive Tree’s catalog. Video tutorials are loaded on the app to help you use its many features.